Palazzo Rezzonico is considered to be one of Venice’s finest museums because of its unique and distinctive character. Situated in the Dorsoduro district on the right bank of the Grand Canal, this extravagant private residence showcases the glory of the city’s great patrician families. During this Palazzo Rezzonico tour you will ascend the Grand Staircase to admire the ballroom with its spectacular collection of Rococo furnishings, glistening glass chandeliers, and magnificent frescoes by Giambattista Tiepolo, one of the 18th century’s greatest decorative painters. 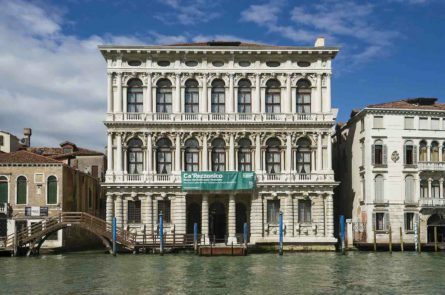 One floor above, among other delights, you’ll find the Chinese-style green-lacquered drawing room and impressive artwork that gives a glimpse into life in Venice during this gilded age. And you won’t want to miss the reconstructed 18th-century apothecary shop- complete with original furnishings and accoutrements -on the top floor.